Schools After School Programs Summer Camps Pediatricians ... and more! • ADHD/ADD • AUTISM • ANGER MANAGEMENT • ANXIETY • DEPRESSION • OCD • MIGRAINES ... AND MORE! WHY NEUROFEEDBACK? BECAUSE IT WORKS! Without drugs and using nationally recognized brain mapping techniques, we quickly establish brain function and initiate positive outcomes using non-invasive, customized neurofeedback training programs. We combine brain training with traditional cognitive behavioral therapies and nutrition programs. We offer a fun and educational learning environment for your dance-loving child. Classes start at just 2 years old! We are looking forward to opening our new building in the Rosemary Square Arts district in downtown Sarasota. We will now have a purpose-built home, including 2 studios and a waiting area for parents. Construction is underway and we will have a Grand Opening very soon! We know you and your children will enjoy being a part of the future of The Sarasota Ballet School. We are excited to launch our new Hand in Hand class for children ages 2-3 and their parents. This class introduces children to the wonderful world of dance while developing their physical skills and coordination in a fun-filled, lively environment. All students receive 2 complimentary tickets to see The Sarasota Ballet perform at the Sarasota Opera House and Van Wezel Performing Arts Hall. We accept students at all levels throughout the year. To arrange a free trial class, contact our Education Administrator. Sarasota Ballet School students have the wonderful opportunity of performing at our annual showcases and other community events throughout the year. 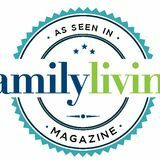 www.floridafamilyliving.com Gulfcoast Family is published four times per year by Florida Family Magazine. It is distributed free of charge throughout Sarasota & Manatee Counties. No portion of this magazine may be reproduced in any form without written permission. Florida Family Magazine is not responsible for statements made by advertisers or writers. All photography and letters sent to Florida Family Magazine will be treated unconditionally assigned for publication and copyright purposes and are subject to unrestricted right to edit and comment editorially. Copyright 2018. Comments and suggestions are welcome. Sponsored by The Brain Wave Center of Sarasota. The ability to pay attention equals better learning, reducing stress and better test results. Calming behavioral issues improves social interactions. Let’s explore three approaches that might help. Pets teach our children valuable life long lessons. Dentistry for Children & Adolescents! pets are great for your kids! Readers Choice Winner for Best Pediatric Care is Weiss Pediatric Care! School is Sarasota Academy of the Arts! Hospital, OB/GYN, Orthodontist, and Pediatrician. of choices for children to be involved in after school. much? Read these six tell-alls. 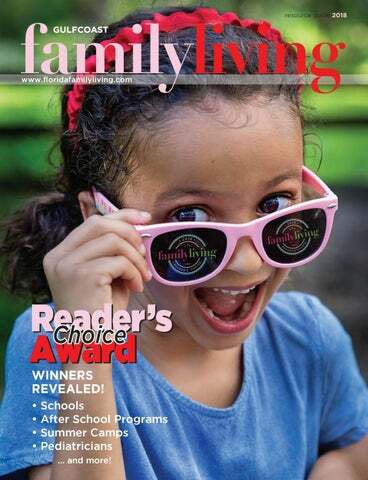 Readers Choice Award Winner for Best Summer Camp is Sarasota Ballet! 20 The Best in After School Readers Choice Award Winner for Best After School Program is Mystical’s Dance Company! ... plus a detailed list of the Readers Choices in Acting and Singing, Arts, Clubs, Dance, Learning, Equestrian, Fitness, Gymnastics, Martial Arts, Music, Sports and Swimming. Readers Choice Winner for Best Birthday Party Place is Bounce Down Under & Sky Zone! Almond Crusted Salmon over Braised Greens Activate brain power! Salmon and almonds are rich in healthy unsaturated fat, a crucial nutrient for optimal brain health. Try this delicious dinner recipe that is nutritious as well as tasty. Some of our fondest memories of being a child are about pets ... I remember dressing up our patient cat for hours on end, putting him in long baby doll gowns and bonnets. Pets can be extremely valuable to your children. They don’t talk back like siblings do and they don’t boss you around like adults do. Here are 10 good reasons why pets are good for kids. 1. They are there for your child unconditionally. Whether your child is in a good mood or a bad mood, that pet doesn’t care. The pet still makes itself available to be petted, carried, played with and sometimes sat on! 2. They are almost always available. With parents being so busy, sometimes children come home to a parentless environment. A pet can make it feel like the child is not coming home to an empty house. They can provide hours of healthy entertainment and companionship for your child. 3. A pet teaches responsibility. Responsibility may include feeding, bathing, medicating, preventative health care, exercising, grooming and of course, cleaning up their messes. 4. Pets have a way about them that unites the family in a common love. 5. The life long lessons your child will learn include giving and receiving unconditional love, nurturing, and honoring all other lives. fully understanding the responsibility associated with that particular pet. Taking the time to properly research your pet to be sure it fits into both your family’s physical life style and economic situation is important. An improper selection could be disastrous. Certain species are high medical maintenance. For example, Sharpei dogs have a high incidence of eye, ear, and skin disease. Iguanas often suffer from metabolic bone disease as a result of inadequate sunlight and calcium. A little research can save your family money and heartaches. Pets teach our children valuable life long lessons. They provide additional love, protection, and enjoyment for our children. Some of their hilarious antics are well worth taping and sending into the world most funniest video program. ! The Out-of-Door Academy is an independent, college preparatory school educating 740 students from pre-kindergarten to grade 12 at two campuses in Sarasota. Our teaching philosophy is defined by the pursuit of excellence and a commitment to build character through a balanced program of academics, the arts and athletics. Each year, 100% of our graduates are accepted to fouryear colleges and universities across the country. Our superior academics are defined by unique programs that cultivate the development of the whole child. The School has continuously implemented new strategies to meet the emerging educational needs of the next generation while staying true to the mission of its founders. Continued curricular enhancements and investments in state-of-the-art facilities and technology promotes hands-on, student-centered learning. At ODA, we provide learning opportunities that transcend the walls of the traditional classroom to better prepare our students to live, learn, lead, and succeed in an increasingly complex and interconnected world. visual and performing arts, advanced placement classes, PE, Spanish, TV/Video Production, and more, to round out their academic day. The goal of SAA is to prepare students to become well-rounded, confident, academically-prepared, and innovative adults who are able to reach their full potential as caring and responsible citizens. From coding in kindergarten to engineering in Upper School, ODA students are encouraged and empowered to pursue their intellectual passions. SPECIALISTS IN PEDIATRIC DENTISTRY Designed to delight & warmly engage children from 1-18 years old, Sarasota’s most modern & unique pediatric dental ofﬁce will entertain & invite your kids to learn about their dental health! We help you ﬁle your insurance. Call us for a complimentary beneﬁts check. both in class and by example. From the moment you step onto our inviting 25-acre campus, you are welcomed into a friendly, nurturing and Christcentered community. Come discover how Sarasota Christian School provides students with the opportunity to discover their passions, develop their talents, and seek God’s direction in their life! • Increases reading levels up to 4 years in only 60 hours! • Does your child require tutoring year after year? • Has your child repeated a grade? • Is your child prepared for the next grade level? • Science based program improves cognitive skills • We make learning fun! Grades: 6th Grade - 12th Grade Enrollment: 40 Class Size: 1 :4 Year Established: 1992 Affiliation: Non - Denom. Grades: 6 weeks - 5 years old Summer Camp: 5 - 12 years old Enrollment: 94 Class Size: School - Varies Summer Camp - 25 per week Year Established: 2012 Affiliation: Non - Denom. Grades: PreK - 5th Grade Enrollment: 250 Class Size: 1: 16 Year Established: 1924 Affiliation: Non - Denom. Grades: 6th Grade - 12th Grade Enrollment: 500 Class Size: 1: 16 Year Established: 1924 Affiliation: Non - Denom. Grades: 6th Grade - 12th Grade Enrollment: 25 Class Size: 1: 8 Year Established: 2009 Affiliation: Non - Denom. Have Family Visiting? We can offer so much more than a spare bedroom! Our resort has fully furnished vacation rentals that include all our park amenities and are available throughout the holiday season right here in Sarasota. Back to school means a return to extracurricular activities for many families. Some children are out of the house nearly every night of the week. I have worked with children and families as a resource coordinator and mentor for many years. When parents come to me with academic or behavioral concerns regarding their children, I quickly ask what they are involved in after school. If the list is long, my advice is usually to scale back and see if things turn around. are just a few of the options available to children in my small town. My daughter brings home a flier for a new activity every day. We all want our children to be well rounded, successful and enjoy their brief time as school children. Enrolling them in enrichment activities seems harmless – and it usually is. However, moderation is key. Children also need time to focus on their homework, socialize with friends informally, spend time with family and just relax. So how do you know if your child is doing too much? Here are five signs that it’s time to cut back on after school activities. YOU SEE A CHANGE IN YOUR CHILD’S BEHAVIOR OR EMOTIONS. THEY DON’T SEEM TO BE ENJOYING THE ACTIVITY. Kerrie’s eight-year-old daughter was rude and argumentative on the days she had dance lessons. She realized that her daughter didn’t enjoy the twice a week, two hour lessons and didn’t know how to tell her. She was relieved when Kerrie gave her permission to stop. YOUR CHILD SEEMS EXHAUSTED. Signs that their activities are getting in the way of their rest include: • Falling asleep at mealtime • Difficulty waking up in the morning • Napping on the way to activities • Nodding off in class • General sluggishness THEIR GRADES DROP. I always advise parents to take a look at what has changed whenever grades plummet. An increase in after school activities is a frequent contributor. Sometimes a child simply needs time to figure out how to balance their new schedule. Don’t allow so much time that they get into a pit they can’t dig out of, though. THEY ARE VISIBLY WORRIED. Stephanie’s son decided to play soccer in addition to participating in the marching band when he entered high school. He maintained his honor roll status, but he was always panicked about having enough time to study and do homework. The next school year, Stephanie told him he could do either band or soccer, but not both. He opted for band and was much more relaxed. IT BEGINS TO IMPACT THE REST OF THE FAMILY. running around to various practices, meetings and activities during the school year, especially when they have more than one child. If you find yourself cranky and bitter that you never have time to accomplish tasks or spend quality time with your kids, reevaluate your family’s activities. Everyone needs to be comfortable with the schedule, including you. So what do you do if you determine your child is doing too much? Sit down with your child and prioritize their activities. I had to do this with my daughter. She was involved in gymnastics, Girl Scouts and guitar lessons. We were out of the house four evenings a week, plus Saturday morning. It was too much. I told her something had to go. She was reluctant at first, but after a lengthy discussion she admitted that she didn’t really enjoy guitar lessons and found the social aspects of Girl Scouts to be overwhelming. She asked if she could drop both activities and add a second session of gymnastics instead. Now she has gymnastics one evening a week and on Saturday mornings. This schedule is much more relaxing and enjoyable for both of us. ! • If you are 18+ and live in Sarasota/Manatee, Join us! • Improve your relationships in just 13 weeks! • Get help with employment and finances • Earn gift cards for your participation • Dinner & Child Care Provided IMPROVE YOUR RELATIONSHIPS IN JUST 13 WEEKS! terminology, and musicality in various forms of dance: Ballet, Pointe, Tap, Jazz, Acro, Lyrical, Hip-Hop, Musical Theatre, Leaps & Turns, Modern, Children’s Classes, Adult Classes, Zumba, Strength & Conditioning, Aerial Dance and more! It is their goal to provide an affordable dance experience, and to touch the life of every child and help them realize that they have something unique to offer the world! symptoms. Re-training unhealthy brainwave patterns can improve and often eliminate symptoms of ADHD, Depression, Anxiety, Trauma/ PTSD, and more. In our experience, Neurofeedback appears to be especially effective for children. We see the most remarkable benefits when working with young and flexible brains, before habits take hold and become a personâ&#x20AC;&#x2122;s template in adulthood. Neurofeedback is quite simple. Brain cells interact, creating thoughts, sensations, actions and emotions; detectable as brain waves. Neurofeedback specifically monitors brain waves, looks for irregularities and then produces a signal that is designed to correct and guide brain waves back into a healthy pattern. WOULD NEUROFEEDBACK BE RIGHT FOR ME? Seemingly unrelated issues such as stress, anger, depression, bad habits, and small injuries can take a toll on our brains, not just our bodies. Like the body, the brain needs exercise and rest to operate at peak performance. By re-training irregular brain wave patterns, we assist the brain in functioning better. This is similar to a computer that, over time, starts storing data that slows it down, and then needs a reboot. Neurofeedback gives the brain that reboot by using a safe, drug free, non-invasive procedure. Research articles indicate that outcomes are typically superior when Neurofeedback is used with traditional treatments such as cognitive behavioral therapy, better nutrition, pharmaceuticals, etc. plan for the client. Talk therapy and Neurofeedback can be used alone or in tandem. We do not recommend that everyone needs to use the dual therapy; it is more of a case by case basis which will be assessed with your health care provider. • Meal Planning • Testing – food sensitivities, potential metabolic issues, etc. • Pantry/Refrigerator Makeover – just like our closets, sometimes the cupboards need to be cleaned out. Consider the philosophy of “food as medicine” and that the food at the end of our forks is either promoting or preventing disease. The pursuit of the perfect diet is difficult and sometimes it is impossible to get the vitamins and minerals we need solely from the foods we eat. Many articles and researchers suggest the following for brain health: • Multivitamin/Mineral • Magnesium • Vitamin D3 • Methylated B-complex vitamins • Omega-3 fats (EPA & DHA from fish or algae oil) Our Dietitian colleague also agrees with the above suggestions as a good foundation. However, with a guide, there can be a more targeted approach customized for you and your family. All recommendations by a Licensed Dietitian Nutritionist are supported by peer-reviewed research and the clinical experience of experts in the field of nutrition. WHAT IS THE CONNECTION? Both Neurofeedback and therapy are processes that allow the brain to rewire itself in ways that feel and work better. Now imagine how much more impactful supplying your brain with the nutrients it needs to support that rewiring process can be. Choosing the right foods provides the building blocks and fuel for a healthy brain. Talk therapy or psychotherapy also is enhanced by the brain functioning at its peak. Overall, the goal is to get your brain functioning at its best. ! For more information on this cutting edge approach call 941-552-4500 or visit their website at brainwavecenters.com. Follow on Facebook and Instagram. At Dentistry for Children & Adolescents, board certified pediatric dentist Dr. Maribel Santos-Cordero believes that each child is a unique individual and understands the importance of providing children with pleasant experiences in a nonthreatening environment. the opportunity to learn about procedures performed. Dr. Santos-Cordero spends time listening to your concerns in order to provide the best treatment options for your child. Focused on prevention, her team is committed to empowering children with the tools to have great oral health. dentistry, management of traumatic dental injuries, laser surgery for tongue ties & dental treatment for the special needs and the anxious child. Dr. Maribel SantosCordero and her team strive to provide each patient with individualized, informative and comfortable care. Dentistry for Children & Adolescents is conveniently located in Lakewood Ranch, Florida. Put vaccines between your child and serious diseases. Protect them from whooping cough, measles, meningitis, HPV, and the flu. Questions? Call or visit our website for hours, locations and facts. pediatric care, the family receives the developmental guidance, skills and support needed to meet the challenges of raising children. From breastfeeding to bedtime, behavior to special needs counseling, they are there for you. Dr. Weiss, Diane and the Weiss Pediatric Care team provide a very special kind of care for kids. Clearly their patients agree as they were named Readers Choice for Best Pediatrician. DR. SCOTT SILVERMAN, COASTAL EYE INSTITUTE ! Coastal Eye Institute is one of the area’s largest ophthalmology practices featuring a comprehensive team of fellowship-trained ophthalmologists in every subspecialty of eye care. From infancy to the golden years, they provide care for the total health of your eyes. Trust your eye care to our specialists! Choosing Dr. Scott Silverman to treat your child’s vision problems means teaming up with pediatric professionals who truly care about their patients, no matter how small in size! Dr. Silverman specializes in pediatric eye care and eye muscle surgery. He is a staff member at All Children’s Hospital, where he lectures to training physicians. Dr. Silverman graduated with honors from Washington University School of Medicine. He completed his ophthalmology residency at Doheny Eye Institute of the University of Southern California. He then completed specialty fellowship training in pediatric ophthalmology and eye muscle surgery at Texas Children’s Hospital of the Baylor College of Medicine. Trust your child’s vision to our pediatric professionals. Dr. Scott Silverman and his team truly care about their patients, no matter how small in size! orthodontic assistants are highly skilled, friendly and gentle. Our administrative team is outgoing, organized and efficient. We value your time and strive to run on schedule and advance your care at every appointment. We offer a variety of treatment options including low profile metal braces, esthetic clear braces as well as Invisalign and other treatment options. Dr. Freeman is a Diplomate of the American Board of Orthodontics (Board Certified) and is a member of the American Association of Orthodontists as well as the American Dental Association. Locally Dr. Freeman has served in multiple leadership positions with the Sarasota County Dental Association and has volunteered his dental services at a multitude of community service events. A Healthy Prevention Pest Approach! Rodents • Termites • Fleas & Ticks CALL TODAY FOR A FREE ESTIMATE! 941.237.1163 We use a solution that is safe & ordorless! SOMETHING FUN FOR EVERYONE Only at the Y. SAVE $50 MENTION THIS AD & PAY NO JOINER FEE! Good things come together at The SKY Family Y. It’s a class for yourself or a sports league for the kids. Support your goals with world-class facilities, or support your neighbors’ desires to live healthier lives. There’s a little something for everyone and a lot for your community. to autism, studies have actually found that there is no true connection between the two. immune than parents would think. The vaccines that are given are less harmful than playing in the sandbox. These myths should not deter you from vaccinating your child. Children who are not fully immunized can get sick suddenly and infect family members, such as grandparents and younger siblings who may be too young to be immunized. Vaccine preventable diseases like whooping cough and meningitis can spread quickly in early care learning centers and schools. O PEN HOUSE NOVEMBER 8 9-10:30AM Exceptional, Christ-Centered e d u c a t i o n f ro m P r e - K t h ro u g h 1 2 t h G ra d e .
GROWING in faith. STUDYING Godâ&#x20AC;&#x2122;s Word. LOVING our neighbor. CARING for each other. SHARING His salvation. Explore in a safe & loving environment! 6 Weeks through VPK Small class sizes with qualified teachers. “Salmon and almonds are rich in healthy unsaturated fat, a crucial nutrient for optimal brain health. Dark leafy greens increase blood flow and fill the brain with oxygen, allowing it to work at full capacity.” - Mikka Knapp RDN, LDN INSTRUCTIONS: 1. Pulse the almonds in a food processor until chopped small, but not too fine. If you don’t have a food processor you can chop the almonds with a kitchen knife. 2. Preheat a large sauté pan on medium high heat. Add 1 tablespoon of olive oil to the pan. 3. Pat the salmon dry with a paper towel (to help the seasonings stick better). 4. Combine the chopped almonds, panko bread crumbs, salt, and pepper onto a plate or shallow bowl. Mix well to evenly distribute. 5. Dredge the salmon in the crust mixture and then place in the sauté pan face down. 6. Cook for 5 minutes on each side, or until thoroughly cooked. The middle should be pink and flake easily with a fork. 7. While the salmon is cooking, heat a second sauté pan over medium heat. 8. Add the greens, garlic powder, and vegetable broth to the pan. Stir to coat. Cover the pan with a lid and cook until greens are tender, about 8 minutes. 9. Serve the salmon over a bed of braised greens and top with a squeeze of lemon. Tip: Pair with a side of starch or grain, such as a sweet potato or wild rice. The best local resource guide for parents on Florida's Gulfcoast. Find the vendors you have been searching for!